An Agera RS was brought to an 11-mile stretch of highway. Was a new record set? Only days after Hennessey Performance revealed its supposed at SEMA, Swedish hypercar company Koenigsegg made a little trip of its own to Las Vegas, Nevada. According to the , an 11-mile stretch of state Route 160 between Las Vegas and Pahrump is closed this weekend for an attempt to set a new top-speed world record for a production car. The event has reportedly been planned for a year and is being hosted by the Spring Mountain Motor Resort and Country Club. The Koenigsegg being used for the attempt is an Agera RS which, according to a reporter from the newspaper, has already hit 291 mph. If you recall, the Bugatti Veyron previously set the top-speed record at 268 mph back in 2010. Point being, even if Koenigsegg isn’t done yet for the weekend, its Agera RS has already beaten the Veyron. 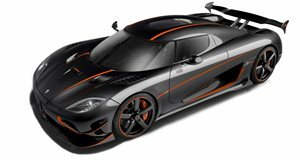 Koenigsegg also recently beat another Bugatti accomplishment, only a short time ago. This also isn’t just any Agera RS. It features the one-megawatt upgrade, meaning it has a total of 1,360 hp and 1,011 lb-ft of torque directed to the rear wheels. Local authorities have also stopped all parking, walking or bicycling along the highway stretch for the entire weekend. Local drivers are being redirected through an alternative route and delays up to 20 minutes are expected. As of this writing, nothing official has been announced by Koenigsegg or even the Guinness Book of World Records itself, but we’ll be sure to provide any updates once we have them.